Beloit Memorial High School Hall of Fame, here I come! Author named recipient of BMHS honor – Beloit Daily News: News: beloit, beloit memorial high school, bmhs, honor, hall of fame. via Author named recipient of BMHS honor – Beloit Daily News: News: beloit, beloit memorial high school, bmhs, honor, hall of fame. I told my son that the plan is to turn one of my alma maters, The Miami Herald, into a casino, and he busted up laughing. Even a 10-year-old gets the irony. The Herald was overall a great place to work. It won’t be the same in Doral. Miami Herald Prepares to Leave Bastion on the Bay – NYTimes.com. via Miami Herald Prepares to Leave Bastion on the Bay – NYTimes.com. Influential trade publication Publisher’s Weekly named Queens of Noise one of the top 10 music books of the spring, right after Burt Bacharach, Billy Ray Cyrus, and Richard Hell. Full text below. This came out quite a while ago, but I was on the road and never got around to publishing it. The Runaways history is scheduled to be published July 9; you can preorder it now. “Never be ashamed to write a melody that people remember,” Burt Bacharach, composer and music producer, once said. The music journalists in yesterday’s Think Local Write Global panel at LMU covered a range of media: daily newspaper, radio, blog, social media. They were experts in K-pop, hip-hop, mariachi, feminist punk, and Touareg. What they had in common is they’re based in LA, and inspired by the multitudinous, er, lay of the land in this city. It was the annual installment of the Syntext/Creative Writing program’s LAy of the LAnd symposium, after all. As curator and co-moderator (with Ruben Martinez), I appreciated the respect Betto Arcos, Oliver Wang, Lorraine Ali, Drew Tewksbury, Allison Wolfe, and Rebecca Haithcoat showed each other — and also their willingness to openly disagree. When Ali and Wang faced off on the issue of whether critics are still critics if they only write positive things — the freelancer said yes, the music editor said no — it was a great learning moment for my journalism students in the crowd. I worried, for a brief time, that all the talk of diminishing expectations, financially and aesthetically, was going to bum the next generation out. But the writers rallied for a sincerely optimistic closing, telling the students that a change is surely coming — and they are poised to be the leaders. 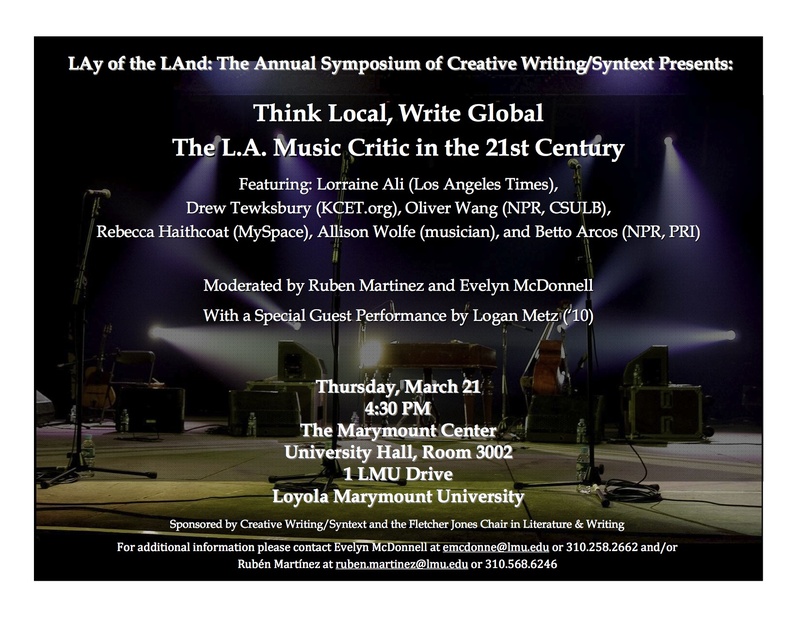 Ruben Martinez and I will be on KXLU today at noon, talking about the 4:30 LAy of the LAnd symposium, Think Local, Write Global: The L.A. Music Critic in the 21st Century.